One of the simplest ways to add a clasp to the ends of jewelry cord is to use a type of finding called a coil end. Coil ends are available in a variety of sizes and can be used with most any type of round jewelry making cord including leather, rubber, waxed linen and others. This article will show you how to use coil cord ends to attach a clasp to leather cord to make this celestial theme casual charm bracelet. 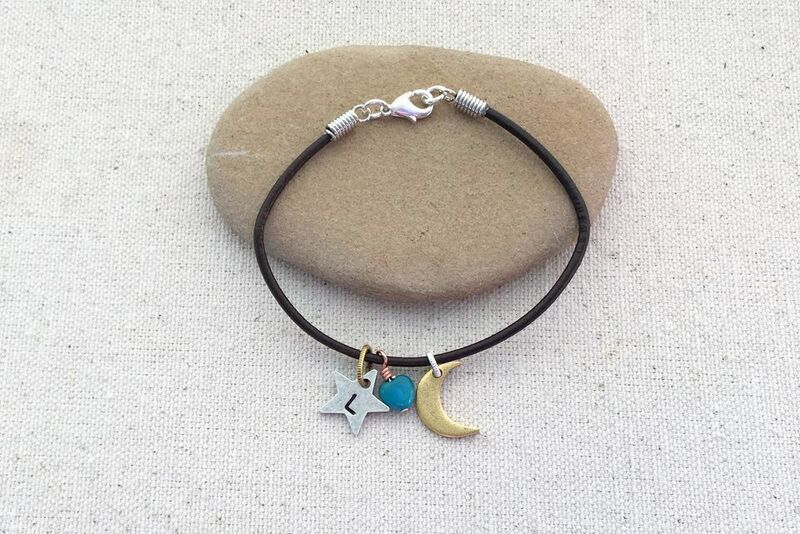 The star and moon charm are both from Nunn Design. I stamped my daughter's initial on the star charm since I knew where this bracelet was going before I even finished it. Coil ends are attached to the cord using glue and by crimping the last coil against the cord. This helps insure that the coil end will stay secure. I like to use E6000 glue, which is an all-purpose craft adhesive. E6000 is flexible but gives a secure hold that is waterproof and temperature resistant, so the glue will hold even if your jewelry accidentally goes in the swimming pool, shower or laundry. Be sure to select a pair of coil ends that have a similar inside diameter as the size of your jewelry cord. The coil end should slide on the cord easily with a small amount of space between the cord and the coil end. Coil ends are available in a variety of sizes and metal finishes. Make sure the end of your cord is evenly cut. A small portion of the end may show by clasp end of the coil and you want it to be neat as well as have an even surface to attach inside the coil. Apply the glue to the coil end making sure to coat the entire surface area that will be covered by the coil end. Add the coil to cover the glue on the cord. Make sure the cord is pushed in all the way. Lay on a flat surface and allow the glue to dry according to the package directions. Wipe up and glue that seeps out of the bottom of the coil while it is still wet. The glue may discolor your cord if it is left in contact too long. The next step of securing the coil end is to squeeze the last coil so it presses against the cord and keeps it in place. This is similar to the way you press down on a crimp. Using chain nose pliers, grasp the coil with the pliers so you are holding only the last coil. Squeeze the pliers to press down on the coil and crimp it against the leather cord. Verify the coil is pressed firmly against the cord and clean up any glue that may be visible. If the crimp does not seem tight, you can repeat the process to press down on the coil and make it a little tighter. Slide charms on the open end of the cord if they will not be able to fit over the coil connectors. Once you have added the charms, you can add the coil end to the other side of the cord end using the same technique. If you don't have any charms, beads on headpins look great on a bracelet like this. Add beads to headpins and add a simple wire loop or wire wrapped loop and then a jump ring. Using your chain nose pliers, open a jump ring and attach the clasp to the ring side of the coil connector. Repeat on the other side of the cord. If you need to add more charms, you can do so using jump rings. Open the jump rings, slide the cord in place, and close the jump ring around the cord. Your leather coil end bracelet is complete. One thing my daughter didn't love about this bracelet was the way the charms always ended up on the bottom of her wrist. To prevent that, I added what I call charm stoppers. They are large crimp covers that I slid onto the leather cord and half closed to keep them in place. They will make sure the charms only move between that small area of leather on the front of the bracelet.